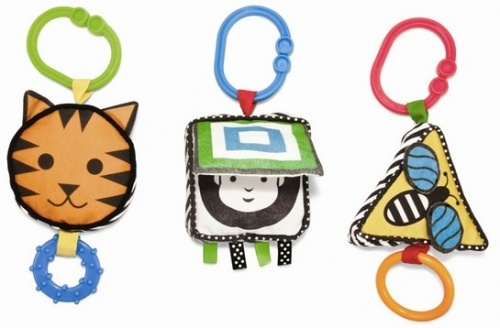 The three individual shapes are soft with black & white and colour graphics. 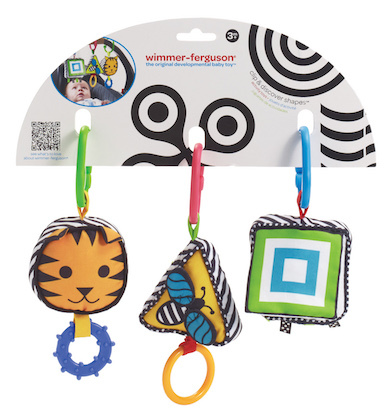 Each highlight a different element for baby to enjoy including: a mirror, flaps, crinkle paper, ribbon, a jiggle pull ring, teether and squeaker. These clip and discover shapes easily attach to most buggies and carriers. High-contrast patterns, all stimulate your baby’s developing vision, while a smiley face and friendly eyes engage attention.